UC Wins Brandon Hall Group Excellence Gold Award for Best Advance in Women’s Leadership Development | Link: UCOP's e-newsletter | Stay Informed. Stay Connected. In recognition of its role as an international leader in innovative public research, UC has won a coveted 2018 Brandon Hall Group Excellence Gold Award for the “Best Advance in Women’s Leadership Development” category for the UC Women’s Initiative for Professional Development (UC WI). 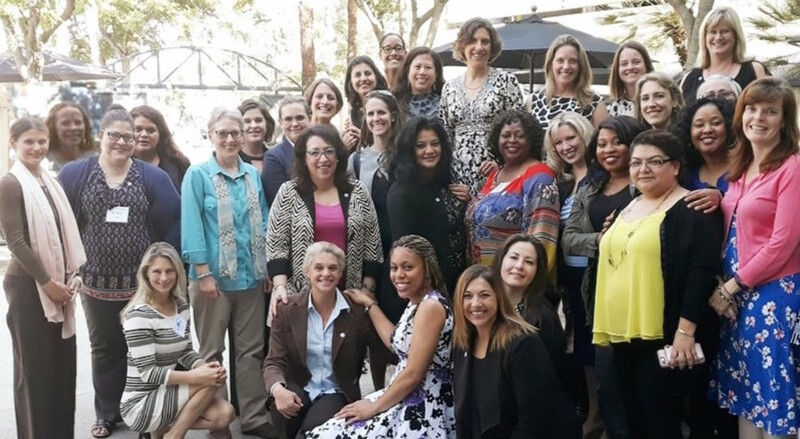 In 2014, the UC Systemwide Advisory Committee on the Status of Women (SACSW) recommended to President Napolitano that UC develop a systemwide program for women’s professional development. With presidential support, SACSW engaged Systemwide Human Resources Talent Management, which supports integrated talent management processes and programs across all UC locations, to develop and manage the systemwide UC Women’s Initiative for Professional Development (UC WI). Systemwide Human Resources Talent Management partnered with Coro Northern California (Coro), a non-profit organization that provides leadership development training primarily to the public sector, to design and deliver the program that began in 2015. By the end of 2018, over 250 women from UC will have completed the program, and an additional 180 women are anticipated to complete it in 2019. The purpose of the UC WI program is to empower women to advance in their careers at UC and to retain women who have demonstrated the potential for advancement. Participants are female faculty, academic personnel, and staff from all 18 UC locations (campuses, health systems, Lawrence Berkeley National Laboratory, Division of Agriculture and Natural Resources, and Office of the President) who are mid-career individual contributors and people managers. “Systemwide Human Resources and Talent Management has worked hard at advancing female talent in the workplace over the years as one of its primary strategic objectives. We are proud to be recognized by the awarding organization for our achievements. It also reflects the commitment of the talented women who helped form and participate currently in this program,” said Dwaine B. Duckett, Vice President, Systemwide Human Resources. “I am very excited about the success and growth of the UC WI — this program represents a model UC system initiative that reflects a productive collaboration between SACSW, UC Systemwide Human Resources Talent Management, and CORO; and it has engaged program participants from across the UC locations. It is wonderful for staff and faculty throughout UC to have the opportunity to participate in this award-winning professional development program, and I appreciate the support at the systemwide and individual UC location level,” said Elizabeth Ozer, chair of SACSW and professor of Pediatrics, UC San Francisco. Brandon Hall Excellence Awards winners will be honored at Brandon Hall Group’s HCM Excellence Conference, Jan. 23–25, 2019.